The context for the above quotation is Our Anonymous Author’s discussion of the method of analogy as it pertains to philosophy and theology (citing, along the way, papal proclamations in 1588 and 1879 which describe St. Thomas Aquinas and St. Bonaventure as “two olive trees and two chandeliers shining in the house of God”). Bowman, Leonard J. The Journal of Religion, Vol. 55, No. 2 (Apr., 1975), pp. 181-198. Kimball, Kasey. Crux, 51 no 4 (Winter 2015), 15-21. As Bonaventure makes clear– along with Plotinus —it is a HUGE mistake to imagine the intelligible realm of Platonic ideas to be a mere aggregate of eternal abstractions. Quite the contrary. Indeed, Nous for Plotinus is the locus of our truth and being — the living and powerful essence of our existence which is, itself, pure act. Moreover, we find that in Nous, which invites comparison with the Divine Intelligence of the Christian Logos, eternity and mutual inclusiveness replace time, space, and separation (Enneads V.9.10). So while, on one level– that of the empirical ego –we may be lost in time and space (consumed by our very material concerns), Plotinus is quite clear that our higher part remains–we need only recollect our race and worth (cf. IV.8.8, V.1.1). To know this higher aspect of ourselves is to know eternal life— authentic Spiritual Life –which is our true vocation (having been chosen/created in Christ before the foundation of the world in the beginning with God). But to realize this also requires the courage to be–the courage to be that which we ARE in Christ, Here & NOW. Thus the exhortation: Take up your cross, the kingdom of heaven is at hand . . . 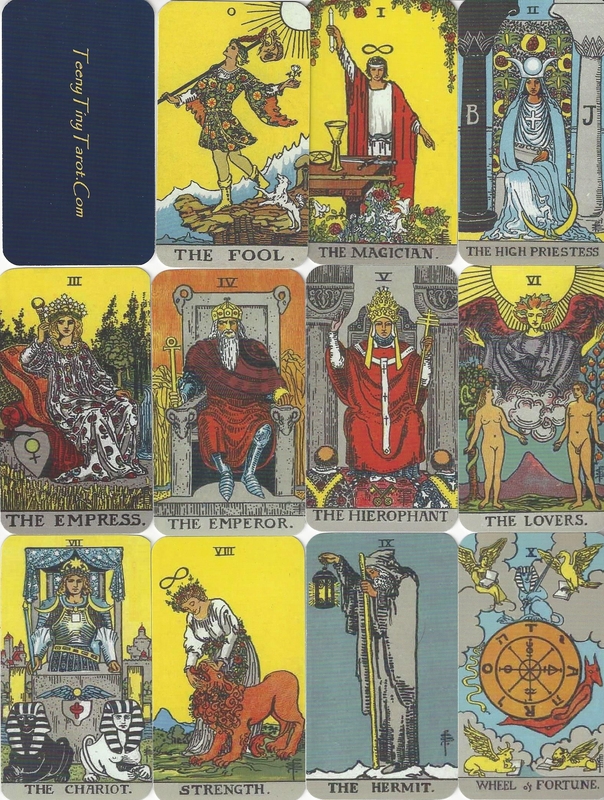 The Tarot has always fascinated the casual inquirer and amateur as much as the seasoned initiate. and “journey of the soul“. 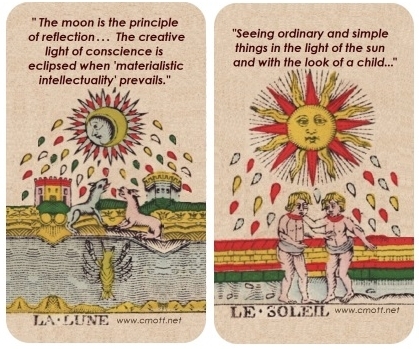 Tarot of Jean Noblet and of Jacques Vieville c.1650, Tarot of Jean Dodal c.1701, Tarot of Nicolas Conver 1760. This tradition, seven centuries old, originates in the knowledge, science and art of the men who built the cathedrals. All tarots which are not rooted in this tradition (effectively dead by 1730) can be called “fantasy”, and just reflect their authors. Personal creations remain creations which are only personal, however erudite or beautiful. The Lover stands in equilibrium between two gravitational fields—the world of the serpent, on the one hand, and the world of the Word, on the other (cf. 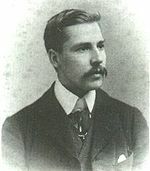 the “psychic man” in Letter XII). 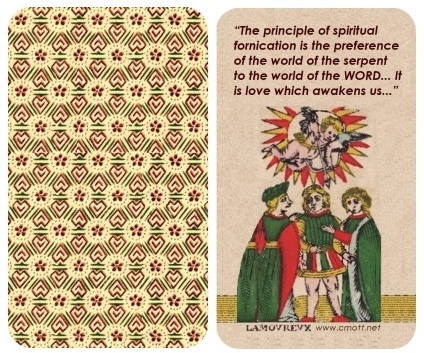 “spiritual fornication“ (143); “It is love which awakens” (126); “the ‘psychic man’ ” (307). 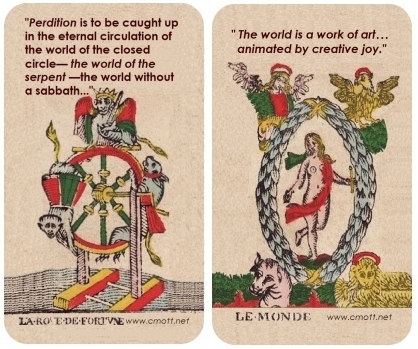 The Wheel of Fortune— aka the world of the serpent —suggests separation and duality (cf. fallen creation, maya, samsara, or simply the rat race). ”the world of the serpent” (242-243, 246-7, 253 – cf. 143;203). The World indicates union / nonduality — the world of the Word (cf. true nature, moksha, nirvana, the kingdom of heaven or kingdom of God). “the kingdom heaven” and “nirvana” are not equivalent in MOTT. The Moon points to our empirical ego and personal self-image—and, more generally, to discursive thought and instrumental reasoning (cf. analysis, calculation, ratiocination—see also The Ace of Swords). “the look of a child” (552). The Tower of Destruction points to the destiny of the egoic mind together with its projects—i.e. the inevitable end of “the story of me”, however successful “I” may be along the way (cf. “the tower of Babel” or “the house built on the sand”). “confronted by divine reality” (444). 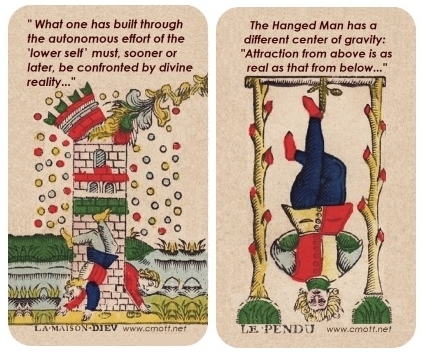 The Hanged Man suggests the possibility of taking up our cross— of “dying before we die” —and entering the kingdom NOW… (aka transcending the ego, being crucified with Christ—cf. Romans 6:4-6; Galatians 2:20). 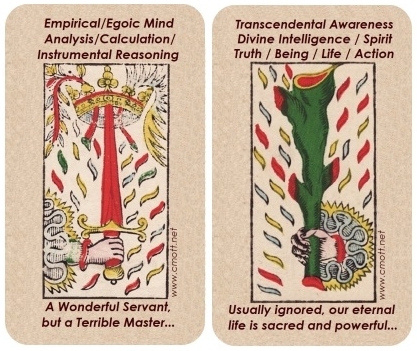 The Ace of Swords, in this context, indicates the rule of the empirical / dualistic / egoic mind (cf. the all too often “arbitrary will” of the “emancipated personality” per MOTT ). “arbitrary will” (411); “emancipated personality” (119—cf. 116, 125, 127). 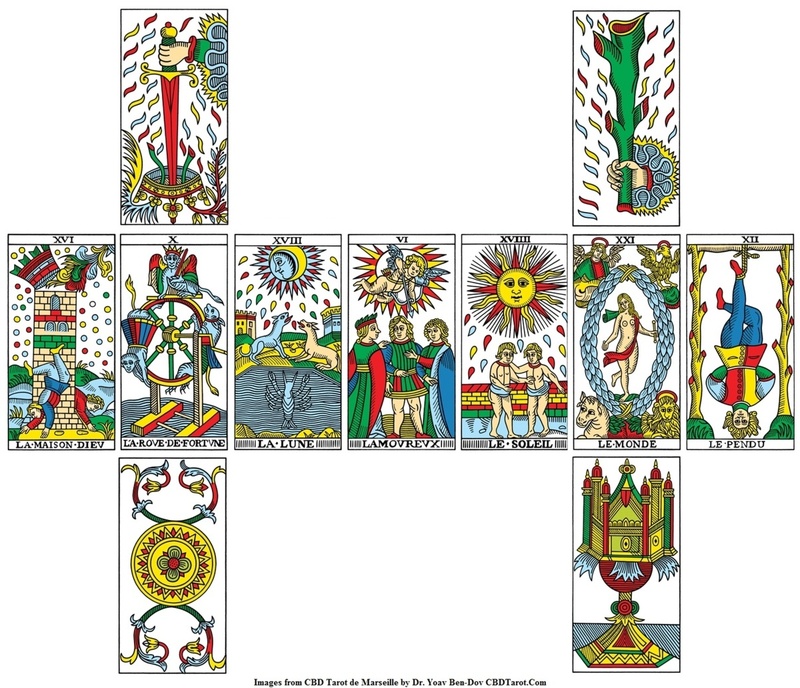 NOTE: The Tarot Aces are not discussed in MOTT and it’s treatment of the Tarot suits is Kabbalistic whereas this approach is best characterized as Neoplatonic. The Ace of Batons points to Spirit / Presence / Awareness / God’s will / our real will— as we are in the beginning —in Christ, the image and likeness of God (cf. GK Nous / Logos / Mind of Christ / Divine Intelligence). NOTE: “Action” as in Divine activity; the ground of authentic action… (not fallen reactivity). 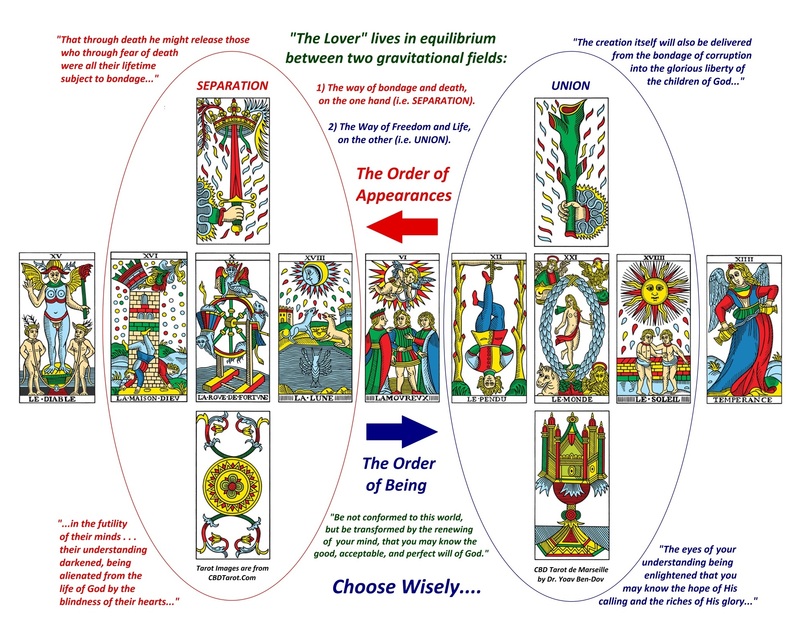 NOTE: The Tarot Aces are not discussed in MOTT and it’s treatment of the Tarot suits is Kabbalistic whereas this approach is best characterized as Neoplatonic. The Devil indicates the temptation of duality and forgetfulness (in material, ideological and/or sensual pursuits). “two personages” (404, 408ff – see discussion of “egregores” for the ideological aspect). “faithful ally” (375 – see pages 374ff for the distinction between image and likeness). The Ace of Coins here suggests the ego’s preoccupation with “laying up treasure on earth” (See Luke 12:15-34; Philippians 3:18-21; I Timothy 6:9-10; James 4:1-3). 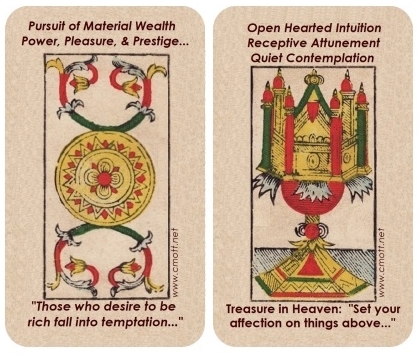 The Ace of Chalices suggests a heart that is open to Spirit (“If you are risen with Christ, seek those things which are above…” See Colossians 3:1-3; Luke 12:15-34). Now, the domain of freedom— the spiritual life —is found placed between two gravitational fields with two different centres. The Gospel designates them as “heaven” and “this world”, or as the “kingdom of God” and the “kingdom of the prince of this world”. And it designates those whose will follows or is submitted to the gravitation of “this world” as “children of this world”, and those whose will follows the gravitation of “heaven” as the “children (or the sons) of light. These “opposing desires” arc the tendencies through which the two gravitational fields manifest themselves. The man who lives in the grip of gravitation of “this world” at the expense of the gravitation of “heaven” is the “carnal man”; he who lives in equilibrium between the two gravitational fields is the “psychic man”; and. lastly, the one who lives under the sway of the gravitation of “heaven” is (he “spiritual man” (MOTT, Letter XII, “The Hanged Man”, 306-307). “The choice before which the young man of the sixth Arcanum finds himself placed is of greater significance that that between vice and virtue. It is a matter here of choice between on the one hand the way of obedience, poverty and chastity and on the other hand the way of power, richness and debauchery. The practical teaching of the Arcanum “The Lover” is to do with the three vows and the three corresponding temptations. “The three vows are, in essence, memories of paradise, where man was united with God (obedience), where he possessed everything at once (poverty), and where his companion was at one and the same time his wife, his friend, his sister and his mother (chastity). For the real presence of God necessarily entails the action of prostrating oneself in the face of Him “who is more me than I myself am”— and here lies the root and source of the vow of obedience; the vision of the forces, substances and essences of the world in the guise of the “garden of divine symbols” (the garden of Eden) signifies the possession of everything without choosing, without laying hold of, or without appropriating any particular thing isolated from the whole —and here lies the root and source of the vow of poverty; lastly, total communion between two, between one and another, which comprises the entire range of all possible relationships of spirit, soul and body between two polarised beings necessarily constitutes the absolute wholeness of spiritual, psychic and physical being, in love —and here lies the root and source of the vow of chastity. One is chaste only when one loves with the totality of one’s being. Chastity is not wholeness of being in indifference, but rather in the love which is “strong as death and whose flashes are flashes of fire, the flame of the Eternal”. It is living unity. “The Christian doctrine and experience of grace expresses the very essence of chastity, just as it also contains the principles of poverty and obedience. It is the doctrine concerning chaste relationships between that which is below and that which is above. God is not an object and neither is he an object of knowledge. He is the source of iiluminatory and revelatory grace. He cannot be grasped, but he can certainly reveal himself. “Here we have chastity, poverty and obedience underlying the Christian doctrine and experience of grace. Now, all Christian esotericism or Hermeticism, including here all its mysticism, gnosis and magic, is founded on the experience and doctrine of grace, one of the results of which is initiation. Initiation is an act of grace from above. It cannot be achieved or produced by any technical outer or inner procedures. 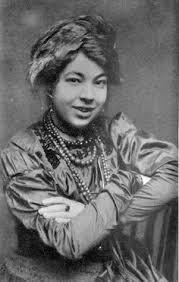 One does not initiate oneself; one becomes initiated” (Letter VI, “The Lover”, pages 124, 133-134). To meditate on these themes more profoundly, let us re-read Letters VI and XII in their entirety and meditate on the image below. Our study guides should also be helpful, but are no substitute for a close reading of the primary text. 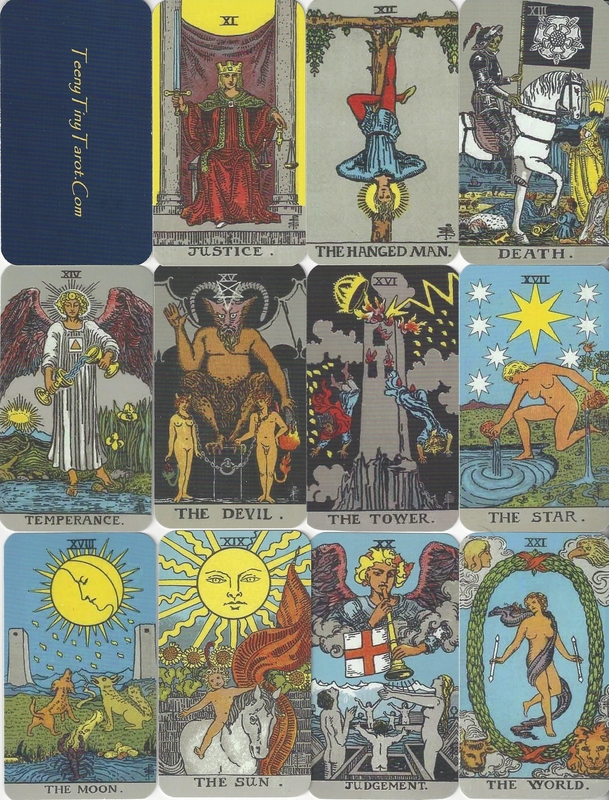 …and partly because the expression so brilliantly captures (what our anonymous author refers to on page 7 as) the game of tarot, while at the same time subtly suggesting how much light an understanding of the history and usage of the Tarot can shed on the subject of hermeneutics in general!